Summer is here and Christmas party season is upon us.. which we all know means a lot of socialising, drinks and food! Many of us struggle with staying on top of our health & fitness regimes during this time of the year, and let's be honest, we adopt a bit of the 'YOLO' mind frame and tell ourselves that we'll eat/drink this now and work it off later, but hardly ever do! So we thought we'd speak to one of our lovely friends, Karyn Galanis, who is a personal trainer and a teacher about some of the trends in health & fitness at the moment, how to stay healthy during the silly season, and hear her tips for staying motivated when 1 January rolls round. Here's what she has to say and hopefully some of this will help you stay on track with your own health & fitness goals during the Christmas & New Year break. 1. 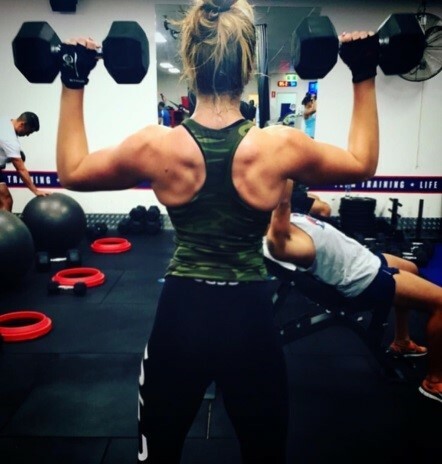 You are a teacher AND a personal trainer – these are two very different jobs – how did you get into personal training and how long have you been doing it for? In all honesty, although these two career paths are very different, they also share many commonalities. I love knowing that i hold purpose in my life by helping others become their best self. I believe that i am a strong-minded and self-motivated person and for this reason, I decided to take on both of these careers. I wanted to share my passion for physical fitness and mental health with the world and guide others towards developing a strong sense of self. 2. You are very passionate about health & fitness and helping women become the best version of themselves. What’s one of the most common complaints you have from your clients about their bodies and what do you recommend for women who want to change a part of their body that they aren’t happy with? Your mindset - you firstly must believe in what you are doing and be positive about the process! This is the most important ingredient! If your mental chatter is negative, you can’t expect your physical results to be positive, they both work together! Sleep/rest – you need to rest your body! People who train twice a day and think that they are benefiting their physique are doing the complete opposite! It is in the rest periods you take that your body changes, modifies and adapts! Nutrition – don’t follow fads and new age rants about gluten, carbs, preservatives etc. As long as you eat predominantly healthy and are satisfying your nutritional requirements for the level of activity you are doing, your body is capable of handling a certain amount of ‘bad food’. I have had my best body shape and physical strength to lift 100kg on a flexible diet! Everything in moderation! Overall, there are many contributing factors that i can’t possibly answer in such a short space, so in a nutshell, focus on your mindset first, then the rest will follow! 3. What are your top tips for staying healthy through the Christmas season when there are so many social events to attend, which means lots of booze & food!? My top tip is quite simple. We don’t ruin our health due to one bad month of unhealthy eating, booze and lack of exercise. It is over the long term that we become ‘unhealthy’ if we don’t push our fitness and focus on our nutrition. So, my answer to that is, enjoy the month off, enjoy the party season and then 1st January 2018, get straight back into it with a vengeance! 4. There are so many diet and exercise trends for women nowadays – what are your thoughts on them and do you have one that you would personally recommend? I think I briefly commented on this above. I don’t believe in diets and trends, everybody has a different genetic make-up and different things work for me that might not work for you! There is no recipe for this, other than educating yourself to understand your body, trying different ways of eating and exercising and seeing how your body responds. It requires persistence and patience! When you don’t get the result you want, change something! 5.Maintaining a work-life balance is something most people struggle with – what can you recommend for those of us who work the ‘corporate life’ and have long hours? Very simple, maintain determination and motivation! When it is lacking, i usually research or YouTube motivational videos to keep me on track! Works every time! I listen to them before i train, in the car, on my iPhone and when I’m down! You need to find a way to push yourself on the days you are tired and sluggish. Self-discipline is key! This works for me! 6.How do you manage your own work-life balance? As a teacher, I am lucky enough to have holidays which for me helps me to keep a balance between work and my personal life and goals. My suggestion is to have a career or job that you love because for me, the reason i have been able to maintain personal goals and be consistent with them is because I am happy with my everyday life and career. If I wasn’t, I wouldn’t have the energy to even think about myself! 7.How do you celebrate Christmas lunch or dinner with your family? 8.Do you cook healthy options for Christmas day? To be honest, Christmas is the one time of year I don’t like to cook! I cook all year for meal prep, so during Christmas I sit back a bit and let mum cook! Haha so, no secret recipes unfortunately. 9.New Years’ resolutions to get ‘fit & healthy’ are a big trend, and this is when you see a big influx of people signing up for the gym and then stop going after a few months. How can people stay focused and committed to being fit & healthy after the novelty and excitement wears off? To be honest this is something that has to come from within. Your self-motivation for wanting to train or exercise has to go further than just looking good! For me it is a bout growing mentally, pushing my own boundaries and testing my limits. My motivation comes from a deeper place! This is the key to staying committed! Make staying fit and healthy meaningful, not just a dress size!